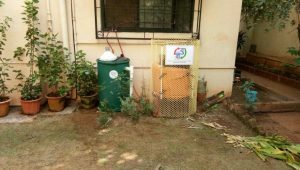 It has been a great inspiration for our work when Commissioner of PCMC started using Vaayu to manage the food waste at the official residence. ‘Be the change that you wish to see in the world’ as said by Mahatma Gandhi is being practiced by our Commissioner. This is at BMCC College, Girls Hostel. This is at the home of Deshpande family. 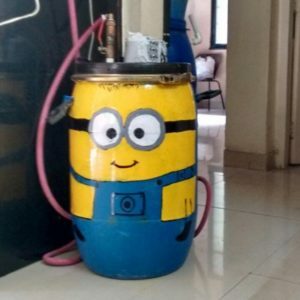 They are managing all their waste at home. This is at the home of Lele family. 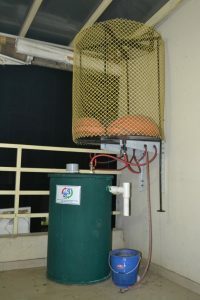 We have increased the capacity by adding a 200 litre digestor so that they can digest more waste from nearby vegetable vendor or hotel. 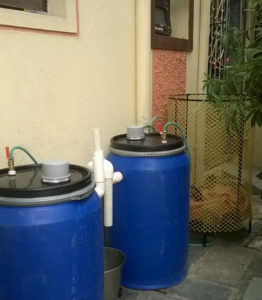 This is at a farm house and a science education space at Hinjewadi. Educational programs about organic farming, green energy, ecology are conducted here. This Vaayu runs on the grass that is available plenty in the monsoon. Also food waste is collected from a nearby hotel. 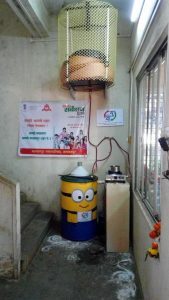 In case of canteens we can provide a canteen biogas burner so that larger vessels and more quantity of food can be cooked. 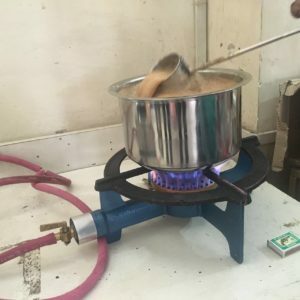 Canteens need fast cooking and this need can be fulfilled using this burner. Some of our vaayu mitras have painted their vaayu to make it look cool. This one is done by our Vaayu mitra Vedvati Lele. 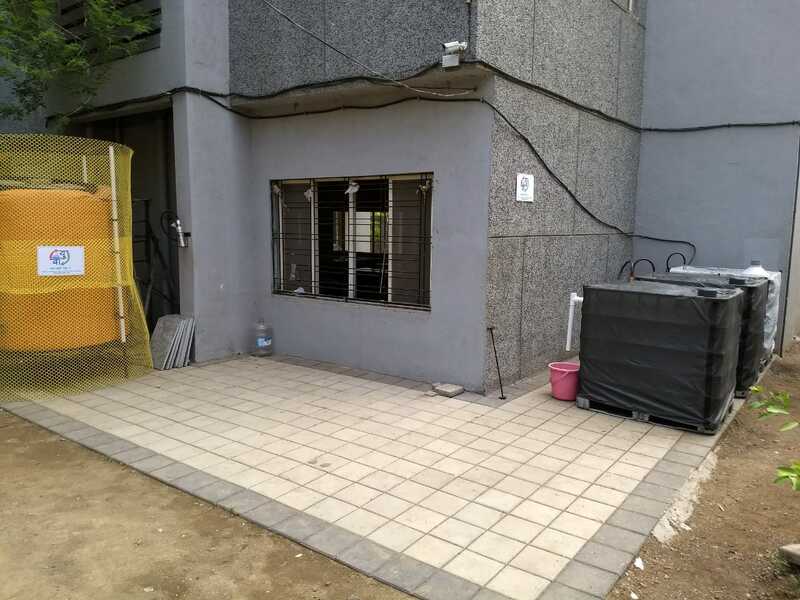 Here we customized pipe fitting, we used quick coupling system, so there is no need to drill a hole in the wall and they can disconnect the burner after use. Vaayu is installed in his gallery, Vaayu decoration done by Vandana Kulkarni. In addition to their own waste they bring waste from vegetable vendor. 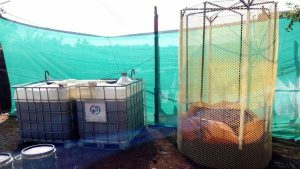 They are more happy because of biogas slurry. They have observed a very positive changes in their plants in the gallery. The speciality of Matheran is there is no vehicle transport system in all of Matheran. Even for waste collection. 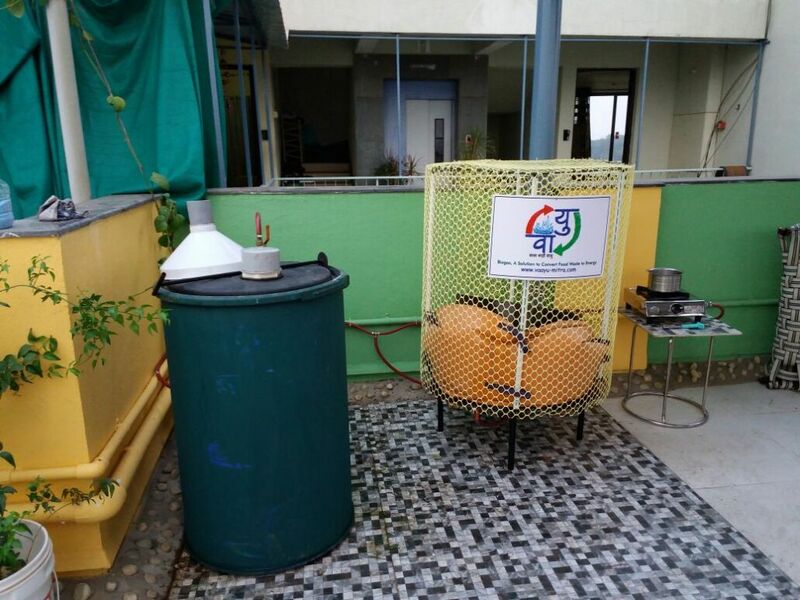 Waste collection form hotels is done with the help of hathadi (Hand cart). 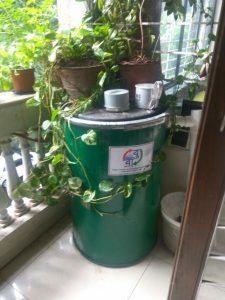 It is very difficult to run because of hilly area and road condition and it is pulled by people Solution for this problem is decentralized waste management system. So, Vaayu is best solution for Matheran. The C.O. of Malkapur Nagar parishad has taken a lead to take Vaayu to schools. 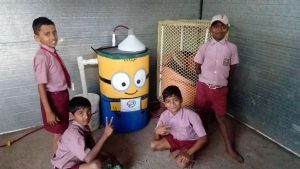 So that children can learn and be aware about the waste management. 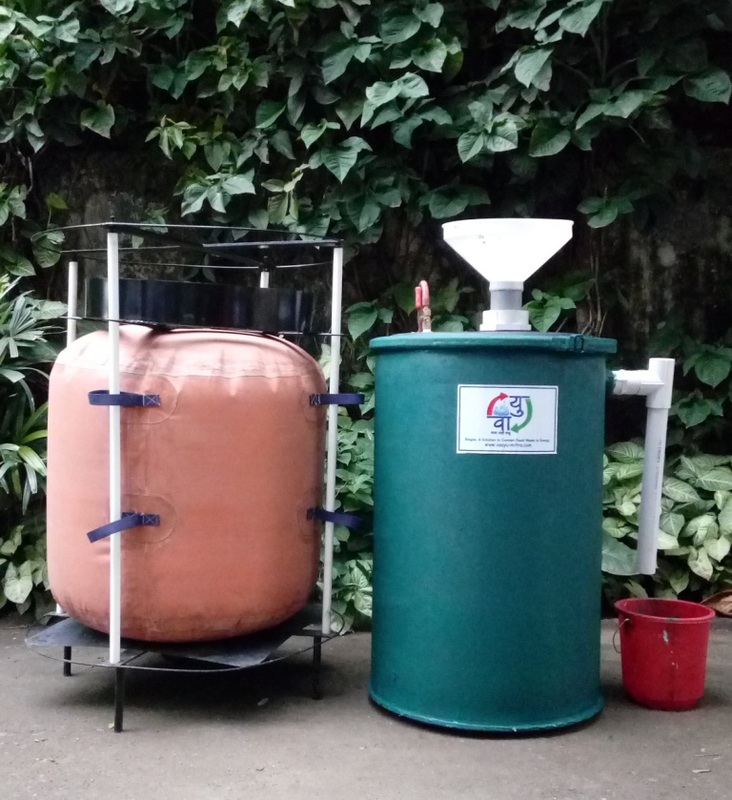 A working bio-gas will help the kids to understand the science behind it. Malkapur Nagar Parishad took the initiative to install Vaayu in the office. This will help citizens know about decentralised waste management and conversion to energy. We find their initiative very inspiring. 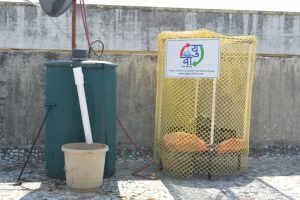 Anuradha tai is very passionate about the environment. She convinced her society to allow her to keep Vaayu on the terrace. She is our first Vaayu mitra from Mumbai area. Here along with the food waste in the house they collect vegetable waste. They are able to generate between 40 to 60 mins of cooking time everyday. 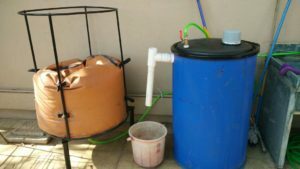 He is an inventor of various science tools, which makes day to day living simple. He is very keen to conserve the environment. 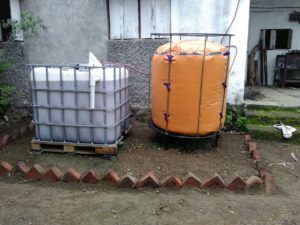 He installed vaayu on his terrace and is using bio slurry for gardening.